I Found My Better Half! Now look at what a good match I found. Meet Cake! Cake is a 2 year old mother of two (Gunner and Hunter). She’s got lots of energy to care for those pups and she loves to play with her foster brothers and sisters. She’ll be with her pups for a few more weeks and once she has recovered, she will be spayed before she leaves rescue. She would love a home with another young dog to play with. 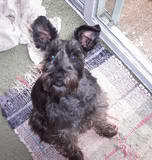 If you have time for Momma Cake, and can take her through group dog obedience classes, you must first apply, then please contact Linda@schnauzerrescue.net and go to http://www.schnauzer.petfinder.com for more information. To complete an application go to the Adoption Application. My mom person says that she is really sad that we can’t adopt Cake right now, but maybe there will be a rescue dog in our future. Stop by Norwood’s to enter this cool contest!